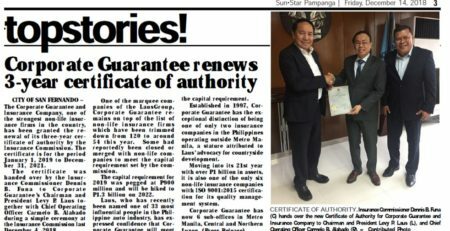 CITY OF SAN FERNANDO — The Commissioner of the Insurance Commission of the Philippines has described Corporate Guarantee as one of the strongest non-life insurance companies in the Philippines today. Insurance Commissioner Dennis Funa made this remark during the 21st anniversary celebration of the company, formerly the Corporate Guarantee and Insurance Company, last Tuesday where he was the guest of honor and speaker. “I would like to congratulate the whole management, stockholders, directors, officers, and employees of Corporate Guarantee who have practiced responsible and effective governance that made you one of the strongest non-life insurance companies in the Philippines,” Funa said. “Today is a very special day for the whole Corporate Guarantee and LausGroup family. As the company turns 21 years old, we recognize this as the first step to our journey to the third decade,” he said. “When we first started in 1997, it was not exactly the best of times. Pampanga was still reeling from the eruption of Mt. Pinatubo and we were just beginning to recover from the devastation, when the Asian financial crisis hit the country and affected many businesses here in the province,” he added. He noted that the unfortunate circumstances did not deter him as the head of the organization, rather made him more eager to provide dynamic and accessible insurance products and services to his kababayans. “We saw the existing challenges at the time, as an opportunity to be as close to our Northern and Central Luzon clients as possible. They are indeed the reason why we are here, and they continue to be our inspiration to this day and for many years to come,” Laus said. “They are our most important assets and without their trust and support, we would not have made it this far. In this regard, I would like to express our endless thanks and deepest gratitude to all of our clients whom we share our success today,” he furthered. Funa, for his part, lauded the company for its numerous feats and achievements through the years, as he recognized its contribution to the country’s insurance industry, which he reported grew nine percent this year compared to 2017. He further emphasized that as Corporate Guarantee goes along and journey towards the future, it must continue to uphold the integrity of the insurance industry for the ultimate benefit of the insurance public. “I encourage everyone to remain steadfast on helping the company stay viable, strong, and growing. Also, continue to implement positive management principles and take more serious measures to prevent insurance frauds. Adapt to the changing times as you have done so for the last 21 years and welcome challenges ahead with heads held high,” he said. Catering to motor, fire, personal accident, casualty, marine and bonds, Corporate Guarantee is recognized as the only non-life insurance company in Luzon with headquarters outside Metro Manila and also the first insurance firm in the country to be recommended by SGS Philippines for transition to the new ISO 9001:2015 version.